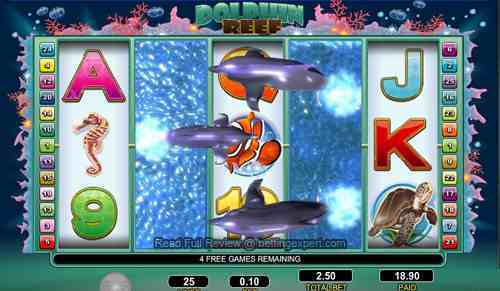 Wager Gaming Technology presents their new online video slot game Dolphin Reef! The beauty of the 5 reels and 25 paylines encloses the riches of the sunken treasure! Dolphins, Treasure Chests, Starfish, Sea Turtles, Sea Horses and brightly colored Fish are some of the underwater symbols players will marvel over. The highlights of Dolphin Reef include the dual-held expanded wilds that create multiple wins on every spin! Any 3 of a kind becomes 4 of a kind and a re-spin feature that is triggered when a dolphin appears on reels 2 and 4. The wild Dolphin symbol is the key to creating winning combinations when they appear in a payline. They will substitue for all symbols including the scatter Treasure Chest symbol. When the Dolphin lands in reels 2 and 4 in the same spin, the respin feature will trigger. Reels 2 and 4 will stay in the reels and become water wilds. Reels 1, 3 and 5 will respin 5 times. While the respins are spinning, the animated Dolphins jumping over the reels from the wild water reels are a very nice touch to the new slot machine. The scatter Treasure Chest will award a prize based on a multiplier and according to how many scatters land in the reels. 3 Treasure chest will award 3 a times multipler, 4 Treasure Chests will award a 10 times multiplier and 5 Treasure Chests will award a 100 times multiplier. Players can frolic with the dolphins at Intertops Casino Classic. Be sure to have a towel with you as this the latest slot is a wet one that will leave you soaked with fun and not drain your bankroll while playing the latest online slot game.